The 406 Coupe Club was born partly out of enthusiasm for the model and partly out of necessity. It was, and still is very easy to be enthusiastic about the looks and the appeal of the 406 Coupe, but finding technical information about the car or finding out how to fix, replace, improve or enhance the components that make up the car is much more difficult. Because the 406 Coupe was made is such relatively small numbers (only just over 10,000 reached the UK market) there were insufficient for the likes of Haynes to produce one of their well known workshop manuals specifically for 406 Coupes. Whilst it is true that some of the engines used in the Coupes were covered within such manuals because they were common between the 406 Coupe and the more mass produced 406 saloon, there was little uniformity between the coupe and the saloon in most other respects, so unless you are prepared to make frequent visits to your local garage, or pay out even more for visits to your local Peugeot dealership, who better to provide help, advice or guidance on the nuances and running of a Coupe than a fellow Coupe owner. This is where the 406 Coupe Club and its members come in. What is now the 406 Coupe Club started life as nothing more than a group on the Yahoo website. From these humble beginnings, a couple of the members decided to have a try at setting up a website specifically for fellow Coupe Owners. 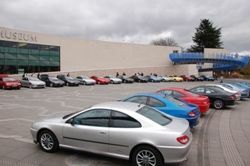 A web address was obtained (www.peugeot406coupe.com) and on 1st February 2005 a new forum was created. Content was understandably a little sparse at the beginning, but as more Coupe Owners began to find the site, the information base started to grow and the site has been expanding ever since. By 2006 the number of registered members had grown hugely and it was agreed that there were more than enough active members to form a club in our own right rather than just an internet forum. A short while later the 406 Coupe Club was formed. In late 2009 due to the original site having not been developed a great deal since it was started, it was agreed that the forum and the whole website was due a revamp. We were fortunate to have one of our own moderators, namely Dave "TeladiPhoenix" Browett on board and he has been solely responsible for creating the bespoke website that now serves both the club and the forum so well. 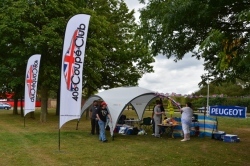 The aims of the club are quite simple, and this is to provide help, information, advice and guidance to current Coupe owners, potential owners and those who simply have an interest in the model. We hold meetings at various locations throughout the country. 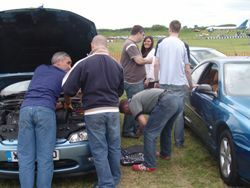 Regular venues have been The French Car Shows, held at Rockingham and Bruntingthorpe. We have also visited amongst other places The National Motor Museum at Beaulieu, and also The Heritage Motor museum at Gayden. Some members have even attended an international meeting, hosted by our French Coupe Club colleagues. These meetings are opportunities for Coupe owners to get together and in addition to putting a few faces to the names they see regularly on the forum, its is also an opportunity to photograph and check out other members cars, run an eye over any modifications that have been made, discuss face to face how these mods were done, ask advice and get shown exactly what and how to check, fix, improve or maintain all aspects of your car with your fellow Coupe owners. Our full club meetings are generally held in the spring and summer months, but throughout the year members often hold smaller local meetings. Everyone is welcome to both the full club and the local meetings irrespective as to whether you are a new or seasoned visitor to the forum. If you check out the gallery on this site you will see numerous albums of photos taken at some of our previous club meetings, and if you look at the Events section, you will be able to see details of any forthcoming meetings that are being planned.